I have been led merrily up the garden path today. The Gacha Garden, that is! The Gacha Garden is a month long Gacha event set in a lovely fairy tale garden and I did find a Fairy. A tough Warrior Fairy archer who will fill you full of arrows if you set a foot wrong in her forest. This is the Warrior fairy set from Astralia. The set includes the gorgeous Rare wings with a HUD to change the colors, a quiver in 2 colors, a set of arrows, a single arrow. the antlers and a set of small wings. And last but most special: a vine entwined bow. I say special because the bow is only available if you play the single machine twenty times. The special twenty play items are called “Seeds of Inspiration”. And each machine has one. Check out the website for all the details on this special play. As I was wandering the garden path, I saw this lovely golden tiara at the Axix machine and I knew it would go perfectly with my warrior fairy. There are three designs available for the Zaria Crown, one with just the crown, one with the crown and the flowers ( with a color change HUD) that I’m showing you and the Rares which have the flowers and a drape of pearls. Last but not least, I needed an action pose for my warrior girl. NC had this well built pose called “Hunting” on the Marketplace for a mere 10L. I think it works really well. Then I needed a good pose to show off the new bow… Verocity had the ‘Isis Pose’ set on sale for only 1L on their Marketplace. This is a sixe pose set that includes it’s own prop bow. I think I’m set. Hair – Sentinus – Eleanor – (Free/0L/ Group Gift group is 100L to join) We saw it here first! Categories: accessories, costumes, events, fantasy, gacha, jewelry, Marketplace, mesh, other, poses, Uncategorized | Tags: 10L, 1L, almost free, astralia, axix, dollarbie, fab free, fabfree, fabulously free in SL, fairy, fashion, gacha, Gacha Garden Event, garden, Julianna Seriman, Lumae, Second Life, sl, SLink, warrior | Permalink. * antielle. The Third Eye – A skin burned third eye makeup layer. * Moon Amore Sakura Necklace – comes in both gold and silver versions. * Schadenfreude Teru Teru Bozu – the little ghost! * Tentacio Food Basket Gift – My shopping basket filled with food. * ::Axix:: Geek Hamster Gift – The geeky little hamster friend on my head. Please note that there may have been more gifts – that is just all I came across today. Categories: accessories, events, Free, Home & Garden, jewelry, makeup, mens, other | Tags: 0L free, 0L Freebies, 0L gift, Antielle, axix, coquet, elikatira, fab free, fabfree, fabulously free in SL, FaMESHed, free in sl, free sl, freebies sl, Geek, Glam Affair, Glitterati, Ikon, Love Trill, Moon Amore, Pure Poison, Schadenfreude, Second Life, sl, Tentacio, Xiasumi School Festival | Permalink. The Twisted Hunt is a shadow … a Spectre…. a ghost… pale cubes spinning driving us mad. There are few hints, a thousand decoys…. But, oh the gifts and Gachas and side games. You only have until April 5th to find all the little cubes. I… I… may have gone a bit mad…. 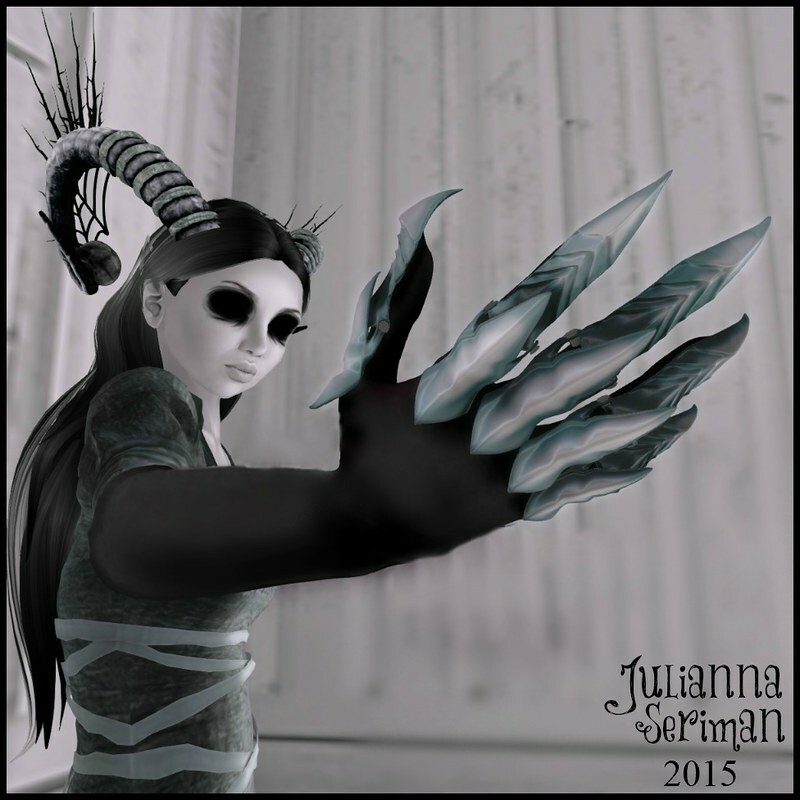 Categories: accessories, costumes, dress, events, eyes, fantasy, Free, gacha, gloves, hair, hunts, mesh, Nails, other, poses, shoes, Uncategorized | Tags: 0L, Aii, Arcadia, Attitude is an Artform, axix, Creepy, dress, fab free, fabfree, fabulously free in SL, fashion, free, free in sl, free sl, freebie, freebies, freebies sl, gift, gifts, Julianna Seriman, little bones, Lumae, Second Life, Secrets of Gia, sl, SLink, The Dark Fae, twisted hunt | Permalink. I’ve been on the hunt again! This time I delved into the darker world of fairy tales with the Brothers Grimm Hunt. This is a 2L per prize hunt and it has some very nifty things. First up is the mesh Peasant dress from ..elation.. This was a new to me store and I very much enjoyed checking it out. The dress is very well made and moves nicely. I bet it would be perfect for a fantasy RP. 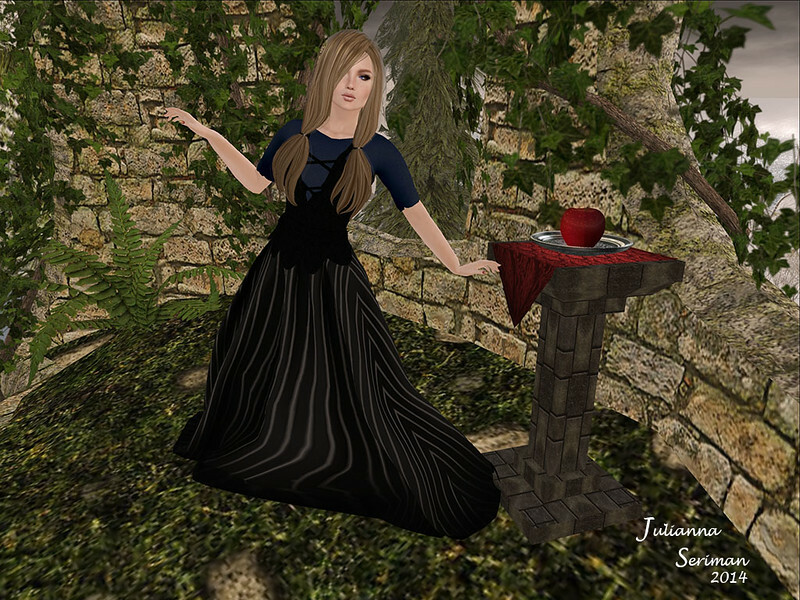 It was the perfect costume to find Potpourri Designs “Poisoned Apple on a Stone Pillar.” The pillar is a great prop for a picture or an RP but it is more than just a prop. It comes in several versions with and without the apple. Completing the scene is the “Aponi” hair style from EMO-tions. This is one of the several in-store Gachas at the mainstore. I’m wearing the “naturals 3”, a pretty taffy blonde. One nice thing about this particular Hunt is there are a varity of styles for the prizes. I found the fantasy/medieval dress then found this funky tank top/short dress. This is B-UniQ’s “The Raven”. Again, so nicely made! I’m not daring enough to wear it alone so I paired it with these dollarbie black leggings from [Eve n Better] found on the Marketplace. Topping off my look is the Argrace Welcome gift hair “Minato” which Tiana Omizu and Love Trill showed us here. UPDATE: As I’m typing this, I checked the website for the Hunt and discovered that ..elation.. is in the midst of moving their store. The Hunt organizers are asking for us to check back a little later for a new SLurl. Categories: costumes, dress, events, fantasy, Free, hair, Home & Garden, hunts, Marketplace, mesh, Nails, pants, poses, Uncategorized | Tags: axix, b-uniq, blacklacebeauty, dollarbie, dress, EMO-tions, fab free, fabfree, fabulously free in SL, firelightcreations, gacha, hunt, potpourridesigns, Verocity | Permalink. Good morning Fabulous Readers! If you are a fan of fantasy skins you’ll be excited to learn that Glam Affair has a new group gift out called Sia – Pearl – Dead Doll. This skin gift features a pearly white sin tone that looks nearly porcelain and has shimmery pink lipstick and eye shadow. The gift pack includes several different eyebrow colours and shapers to suit your hair colour and style. The Glam Affair inworld group is 30L to join, but they do put out regular group gifts that are always fabulous! Categories: group gifts, groups, skins | Tags: 0L, axix, fab free, fabfree, fabulously free in SL, free in sl, free skin sl, free sl, freebies sl, Glam Affair, group gift, Ikon, lap, Second Life, sl, Tales of Fantasy, Truth Hair | Permalink. October is probably my most favourite month and not just because of the fun that goes along with the lead up to and the dressing up for Halloween, but because its the first full month that feels that Autumn has finally arrived and you get that lovely chill in the air that means you can start snuggling under blankets and cosy cardigans. Today I am showing you a few more Halloweeny themed things.. In Second Life, its one of the major holidays with heaps of Fairs, Gachas, Hunts and store gifts all with fun spooky themes. You can never fail to find some really amazing freebies! The new free group gift from AZUL makes such a great little dress that would be suitable for a witchy or vampire themed outfit. You could even make a cute little demon girl while wearing it! The sleeves are seperate option which I think is a great idea. I love little details like wings and horns as you have seen from previous posts and you can find both of these as freebies! My horns are the Horns Flowers freebie by PANIK that you can find at The Seasons Story while the Dark Angel Wings are a freebie by AXIX that you can find at The Bloody Horror Fair. I really love the little gothy balloons that are a current subscriber gift at Label Motion. There are three different balloon sets with and without poses which are really cute. My amazing shoes are the Halloween Smile Shoes for SLink High Feet that are the new group gift by Macabre and are the perfect spooky footwear to add a little horror flair to any outfit! To get these, join the group and then click the little coffin box that is on the steps near the stage! The necklace I am wearing is by Vintage Touch and is available in their gacha at the FabFree Halloween Gacha event at the FabFree HQ. It is L$50 per pull to play and is available in eight different version .. below I am showing four that I managed to win! I showed the free Poppy skin from Glam Affair that is also found at The Seasons Story on my post here.. below you can see how it looks without wearing the Loud Mouth mesh lips that I wore in the pictures before. Also you can see Sadist Rings that are a group gift by Violent Seduction. There is a L$50 join fee but its so worth it as there are a couple of other great gifts to pick up also. The amazing eyes I am wearing in the picture are the Salvatore Eyes by Random.Matter that you can also find at The Bloody Horror Fair. These are the bloody version which comes with make up layer options to make it look like you are crying bloody tears. They arent free but I just love them so I had to show you them. Lastly, The nails I am wearing in the pictures are a group gift of Metallic Nails by NI.JU! There are a lot of colours to choose from as you can see from the HUD below! Categories: accessories, appliers, dress, events, FabFree Headquarters, gacha, group gifts, groups, jewelry, mesh, Nails, poses, shoes, skins, subscribe-o-matic | Tags: axix, Azul, Bloody Horror Fair, fabfree, FabFree Halloween Gacha, fabfree in sl, fabulously free in SL, free, free in sl, freebies, Freebies in SL, Glam Affair, group gift, Imeka, label motion, Macabre, ni.ju, Panik, Random.Matter, SLink, The Mystic Realms Faire, The Seasons Story, The Seasons Story 1 Year Anniversary, Tiana Omizu, TRUTH, Vintage Touch, Violent Seduction | Permalink. This weekend seems to be all about the quickie posts for me, because here is another. 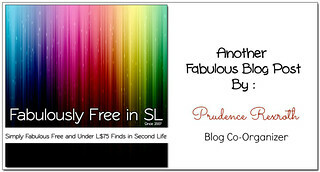 Well, it’s only a quickie because you only have 2 days left to grab all the goodies from our very own FabFree Birthday Cupcake hunt, and I am showing you a few things you may be missing out on if you haven’t already finished this super easy hunt. The second gift I have on is from Asteria Creations, and is a lovely, fresh-faced skin with pale pink lips and eyeshadow, with a hint of yellow on the upper eyelids. The *Asteria Creations – Myia Skin – Sahpe PALE, comes with its own shape, which I thought would be fun to show you beside a shot with my own shape. I am on the left, and the shape included is on the right, and I will admit, I am a touch self-conscious about how far my ears stick out with a slick, pulled back hairstyle, and the other shape really makes it obvious! LOL. The eyebrows on this skin are a touch paler than what I am showing, as I just had to try out the brow out makeup, I showed you before HERE, again. So, I will tell you, to get the skin gift, you are going to have to head over to the Asteria Creations main store, which is located HERE, as there was a tiny snafu in placement 🙂 Don’t worry though, I think it is worth the trip, and it was still pretty easy to find 🙂 The 1-800-Bettie’s gift though, is located at the FabFree HQ, along with so many other goodies. Just in case you haven’t seen it yet, here is the link to the Official Hunt Page, with preview pics of all the prizes, as well as links to prizes that we blogger’s have shown off. You only have until the 16th to get these gifts, so you better get over there right now! Seriously, right this second, well, ok, maybe finish reading my post, and then fly as fast as you can. LOL. Categories: appliers, dress, events, FabFree Headquarters, formalwear, hunts, quickies, shapes, skins | Tags: 1-800-Bettie's, Amacci Hair, Asteria Creations, axix, BLINDED, Chaos Panic & Disorder, FabFree 7th Birthday Hunt, Ikon, Insanya!, SLink, The Arcade, Yummy | Permalink. With all the Fantasy type events and hunts going on right now, I figured it was high time I did a post that was fantasy related. Staying within my fantasy mood, I hit up this round of The Fantasy Room, and found this beautiful headband from GED. The Ethnic Swirls headband, in silver, is only L$50, but if you prefer gold, there is also a gold version available. I love the delicate swirl right in the middle of my brow, I feel like an elf princess with this piece, I just need the pointy ears now! My last stop was at a more sci-fi event, The Nexus. 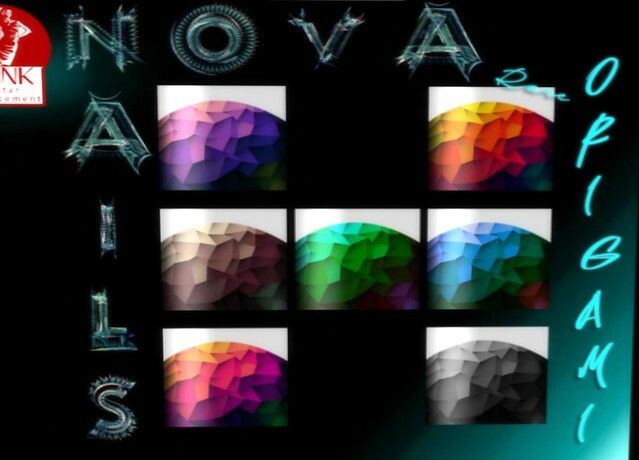 There, I played the Nova Gacha for Origami SLink nailpolish, at just L$25 a play. I lucked out and actually got matching peach finger and toe polish after only 4 tries! I really like the pixellated look of this polish, and can see myself wearing it quite often. I’ve included a picture of the vendor so you can see the different colour combinations that are available. So, what do you think? As I was taking my picture, being photo-bombed by a roaming ferret, I was expecting characters from the Narnia books to just pop out of the trees. Fantasy is one of my favourite genre’s, and I really should do more posts like this. Expect more from me! Until next time, I’m going to go check and see if that ferret can talk 🙂 TTFN! Categories: accessories, costumes, dress, events, fantasy, gacha, Home & Garden, hunts, jewelry, mesh, Nails | Tags: axix, Catwa, Ikon, Lumae, SLink, the fantasy room, TRUTH | Permalink.